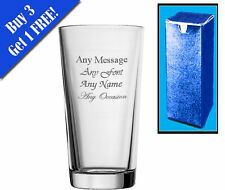 Personalised Engraved Perfect Pint Glass. Capacity: 20oz (Pint) 600ml. If you do not pick a font we will pick a popular one for you. Line 4 = Example Text. Line 3 = Example Text. Line 2 = Clipart. Line 1 = Example Text. 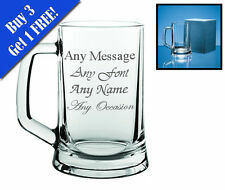 Personalised Engraved Beer Glass Tankard Free Gift Box 500 ml. Text colour no colour just engraved into glass. 1 x Year ( made in ?. You Need To Send us. ). 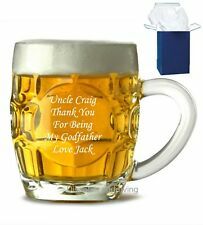 Personalised 2 Pint Glass Tankard Best Man Wedding Favour Engraved Free. Personalised with up to 5 lines free max 15 characters each line including spaces. The Stein Glass will hold 2 pints however the line on the glass is unofficial and may be slightly inaccurate. Personalised Engraved tankard. Heavy Base Stern Tankard. 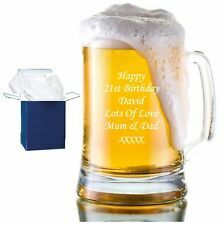 Personalised with up to 7 lines free. 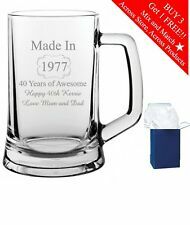 Beer Tankard Pint Glass. Glass supplied in a folding gift box. Line 1 : Age up to 2 Characters. This item is a Large 18oz. Size Heavy Base Stern Glass Tankard.